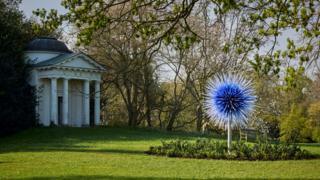 Visitors to Kew Gardens this spring will see a different kind of flowering, courtesy of celebrated US artist Dale Chihuly. Fourteen years on from his last exhibition at the Royal Botanic Gardens, the Seattle-based sculptor has returned with another display of his luminous, arresting artworks. 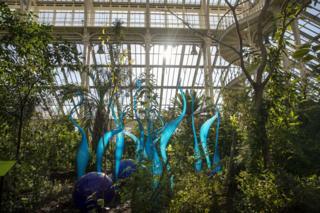 The Reflections on Nature exhibition includes such works as Sapphire Star, first composed in 2010 and now taking pride of place beside the gardens' Victoria Gate. Made up of individually blown forms assembled to resemble a translucent orb, it is one of 32 separate installations situated across the west London landmark. 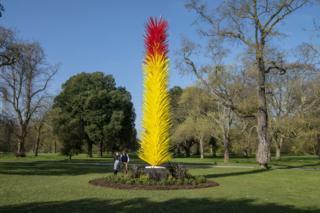 Others include this Scarlet and Yellow Icicle Tower, an imposing structure made up of 1,882 separate elements. According to Chihuly, who was born in Tacoma, Washington in 1941, there is "very little breakage" moving his pieces from place to place. The gardens' Temperate House, which reopened last year after a five-year restoration, plays host to a new artwork specially designed for the world's largest Victorian glasshouse. Suspended 19 metres (62 feet) above the ground, the Temperate House Persians offer a spectacular counterpoint to the 10,000 plants beneath it. There are artworks at ground level too, among them these Turquoise Marlins and Floats from 2015. "How can you not love Kew?" 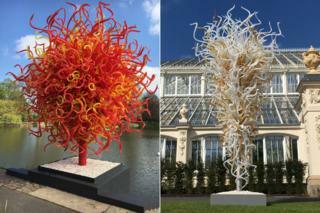 Chihuly told BBC London this week, praising its "extraordinary" glasshouses and "magnificent" landscapes. 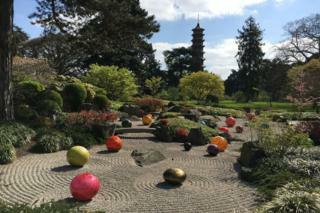 Moving outside again, the Japanese Garden beside Kew's famous Great Pagoda provides a home for Dale Chihuly's Niijima Floats. Named after a volcanic island in Tokyo Bay, the exhibit is made up of brightly coloured glass spheres, some of which weigh up to 60 pounds (27 kilograms). 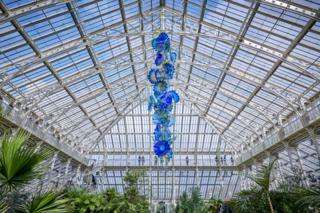 Summer Sun, a piece made up of 1,483 separate elements, is one of a series of sun sculptures that date back to 1998. The Opal and Amber Tower to the right, meanwhile, grew out of Chihuly's fascination with chandeliers like the one he created for the Victoria and Albert Museum in 2001. 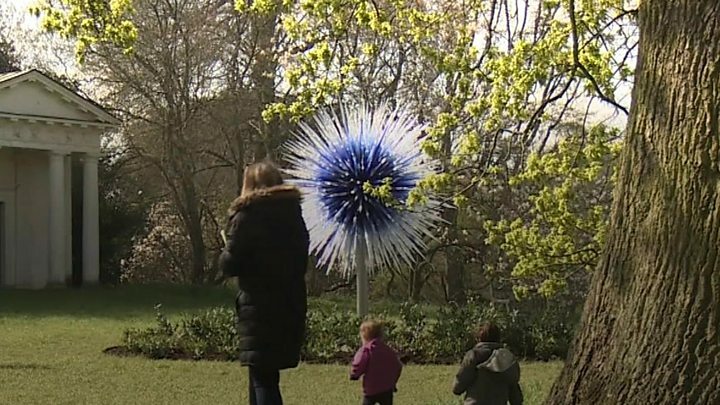 Chihuly, now 77, has said that he wants his work "to appear like it came from nature, so that if someone found it on a beach or in the forest, they might think it belonged there." 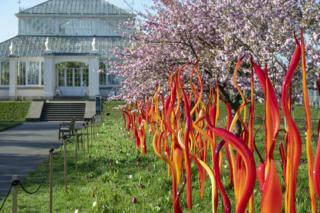 Chihuly: Reflections on Nature is on show at Kew Gardens from 13 April to 27 October.